Why are you called 'No Tie Software'? We are determined to never have to wear a tie for work again. Apple's AppStore and the iPhone and iPod Touch offer the opportunity to deliver applications worldwide without the old school brick and mortar, shrinkwrap, ship, and inventory model. Also, ties represent form over function. We believe apps should be designed to be usable, quickly and easily, without unnecessary frills. If you feel that way too, check out our T-shirts! You guys are great and so responsive! How can I help? Thank you so much! We appreciate the feedback, including product suggestions. Anything that makes our products better is great. Your positive reviews on iTunes go a long way! After all, we are iPhone users too, so when we shop for apps, we give a lot of weight to the user reviews, too. Please tell your friends! The more business, the more we can reinvest in making our apps more useful and everyone benefits! 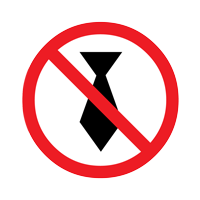 Consider a No Tie T-Shirt! They make great presents! Also, we are running a funniest ringtone / video contest! We're giving away tons of prizes like cases, chargers, earbuds and more! Send us your best ringtone or a video of how you use our apps so we can upload them to our You Tube channel! How many sounds are included? We believe it is better to UNDERcommit and OVERdeliver. In other words by promising 100 sounds and giving you HUNDREDS OF SOUNDS, it's a great deal. Plus, we like the name and reserved the domain name www.100sounds.com! But we got carried away and couldn't stop adding sounds! Can I have a FAVORITES button? Even better, you can move all of your favorite sounds to the top of the list, and still have access to less frequently used sounds. In the Edit mode, look for the THREE HORIZONTAL LINES next to each sound. Drag the lines up or down to reorganize sounds! I would like to use some sounds as Ringtones. 100sounds, 100birds & 100animals were developed first and foremost as Sound Effects apps. But, based on user requests, we have made the sounds available as ringtones BY WEB OR EMAIL DOWNLOAD. There are strict limitations on what an app can do. An app MAY NOT duplicate the functionality of iTunes. After all, there's a lot of money to be made by selling ringtones. HOWEVER, we aim to please! So you can have ALL of the sound in our apps as ringtones FOR FREE! And NOW YOU HAVE TWO CHOICES... Ringtones by EMAIL or by WEB! CHOOSE WHICHEVER METHOD YOU FIND EASIER! Press the (i) button in the top-right of the app to go to the INFO page. On that page, press the rectangular button that says 'Visit' etc. CAREFULLY enter your email address & press REGISTER FOR RINGTONES. WEB METHOD: USE YOUR MAC OR PC TO VISIT THIS SITE AND CLICK ON RINGTONES FOR REGISTERED USERS (top of page) to download ringtones. Download the .m4r ringtone file(s) and save them to your computer. Double click on the .m4r files or drag them into the Ringtones area of iTunes. The ringtones will then be available for syncing with your iPhone! How do I create my own custom Talking Ringtones? We have several apps (AutoRingtone, Ringtones Uncensored, AutoTTS, & Free Speech Tones) to do just that! Type your message in the text box and it will be spoken in the voice of your choice! We offer DOZENS of voices in the PRO versions! Some apps also offer the option of ~200 introductory sound effects which you can use to 'get your attention'! We also have European voices (Spanish, French, German, Italian, Russian and more... many in Male and Female variations) in Ringtones EURO! You type your email address, once, so you can receive an instructional email and download your ringtones by visiting www.AutoRingtone.com and logging in with the same address you entered using the app. AmericanMan, AmericanWoman, Babe, BritishMan, BritishWoman, Butler, Chimes, Devil, Froggy, Gal, GPSGal, GPSGuy, IrishMan, JerseyGirl, Kid, Lady, LaughFactory, Lisp, OldMan, Organic, PCDude, PCGal, PCGirl, PCGuy, PCKid, PCLady, PCMan, PCWoman, Queen, QuietTime, Robot, SouthernGirl, SpaceAlien, Sultry, Synthesizer, ValleyGirl, Whisper, & Yeller! What is the difference between the various apps? AutoRingtone: Just type a contact's name and a standard message is created (_YourName_ your phone is ringing. _CallerName_ is calling. _YourName_, please answer the phone.) so it's quick & easy to create ringtones for all of your contacts. PRO version has 100+ sound effects & dozens of voices, plus speed & volume control! Ringtones Uncensored: Type any message, select from 100+ sound effects & dozens of voices! Designed for iPhone & iPod touch, but works on iPad. PRO version has 100+ sound effects & dozens of voices, plus speed & volume control! Free Speech Tones: Similar to Ringtones Uncensored but redesigned for iPad's larger screen. Use a full-size keyboard & select from 100+ sound effects & dozens of voices! Offers speed & volume control. AutoTTS: Similar to Freedom of SpeechTones but without the intro sound effects. Uses buttons for each speaker so it's easy to select / play with voices. PRO version offers speed & volume control. Ringtones EURO works like Ringtones Uncensored but includes Spanish, French, German, Italian, Russian and more! Many of those voices are available as Male and Female speakers! Offers speed & volume control. I cannot hear sounds, or run, or download the app. Tens of thousands of users are using the app successfully. Here are some things to check. If you cannot run the app after upgrading, DELETE and REINSTALL the app from your Mac or PC. Is your iPhone's ringer switch on MUTE? Or is your audio output set for headphone not speakers? You might be low on memory (RAM, not storage). Try powering off and rebooting your device by holding down both the POWER and HOME buttons for ten seconds until you see the Apple logo. Is your cellular service poor? Try downloading via iTunes from your PC or Mac. Are you using the latest version of the iPhone O.S.? Is your phone 'jailbroken' or unlocked? If you check all of these and for some reason cannot run the app, please contact us so we can make things right. Some of the sounds seem cut off or have quality issues. Please update to the newest version! We have replaced, enhanced and added hundreds of high quality sounds! If you still think a sound needs to be enhanced, please let us know which sounds so we can enhance them. In our effort to keep the file size manageable (Less than 20MB, the limit for downloading wirelessly) and still have hundreds of sounds, we have kept all sounds to be under 5 seconds. But we can fine tune specific sounds if it's a concern. You need to register, using the app on your iPhone, FIRST. To get to the screen where you enter your email, run the app and touch the (i) button in the top right. Then, touch the 'visit' button to go to our website. On the screen that loads, you will be able to enter your email address and REGISTER. No app has access to your email address, unless you provide it, which is a good thing, if you think about it. Make sure you typed your address correctly, using the app. Next, you can continue using the iPhone to select specific ringtones you want to have emailed to you. Select individual ringtones by category OR ZIPFILES which are collections of ringtones in a single file. This way you can have 100+ ringtones on your computer in seconds! Alternatively, you can head over to your Mac or PC and start downloading ringtones using the web method, now that you are registered. Just visit www.NoTieSoftware.com and click on RINGTONES FOR REGISTERED USERS, in the header, and ENTER THE SAME EMAIL ADDRESS YOU ENTERED USING THE APP. Also, make sure you select the app you used (100sounds, 100birds, or 100animals) as it defaults to 100sounds. Download ZIPFILES and follow the directions. How do I download my Custom TEXT-TO-SPEECH ringtones? After you create your ringtones using the app (AutoRingtone, Ringtones Uncensored, Free Speech Tones, AutoTTS, etc. ), next, ON YOUR MAC OR PC, visit www.AutoRingtone.com. Click on DOWNLOAD YOUR RINGTONES. Login with the same email address you entered using the app. Select which ringtones you want to use. Download the .m4r files and open them in iTunes, if you have an iPhone. If you have a different phone, download the .aiff files. AIFF files should work in many phones, but some phones might require conversion to MP3. You can download software like Audacity (free for Mac or PC) to do this. You must save the ringtones to a permanent place on your computer, such as your Documents directory. Then, if you still have them in ZIPFILE format, double click on the zipfile to extract/uncompress them. Next, double click on the .m4r ringtone files and they should open up in iTunes. If not, drag them into iTunes manually. You may also be able to right-click on the .m4r file and specify to Open With iTunes. Some users have had trouble with Opera or Chrome browsers. Those programs do not know how to handle .m4r files. Instead, try Firefox or Internet Explorer. You might have changed the defaults in iTunes. If you have iTunes set to 'Sync Manually', then that applies to Ringtones as well as Music, Movies, etc. In that case, you need to drag the specific ringtones over to the tiny icon of the iPhone, under Devices, in the left of iTunes. Another problem could be that you did not save the ringtones in a permanent place and you disabled 'Copy on Import' in your iTunes Preferences. If this is the case, you never imported the ringtones into iTunes... you just pointed iTunes to a temporary file that no longer exists. To solve that, delete the pointer to the missing ringtone and go to Preferences. Check the Copy on Import tab and repeat the steps to load the ringtones into iTunes. I have the ringtones on my iPhone but I cannot seem to connect them to a specific caller. This has to do with how AT&T or your other wireless provider transmits caller ID information. For example, you might have a user stored as 1-876-543-1200 but your carrier is transmitting 876-543-1200, without the leading '1'. Try experimenting with different formats until it works. You could also delete the number, and have that person call you, and then save that number. It will be saved in the same format that your carrier users.